It’s taken a while but YouTube has finally added support for user accounts in its updated client for phones running the Nokia-led Symbian OS. Announced on the 10th of March, users can now log into their YouTube account enabling them to access their favourites, subscriptions, and videos. 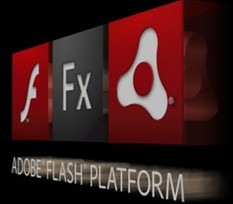 YouTube stated that it has taken them this long because they wanted to focus on speed of search and playback. Also new to version 2.4 is suggested search terms as you type in a search query. The Symbian Foundation, the custodians of the Nokia-led open source mobile OS of the same name, has published a concept video showcasing the User Interface changes we can expect in version 3. The UI is seen as a major weakness of Symbian, especially as it transitions away from its S60 ‘scroll-and-click’ non-touch roots to something more finger-friendly. So how is Symbian S^3 shaping up? Pretty darn good, if the video is to be believed. The UI borrows plenty from the iPhone but also adds a splattering of Palm-esque app switching – similar to WebOS’ card view (see review) – as well as building on some of Nokia’s own UI ideas, such as the widgetized home screen we first saw on the N97. 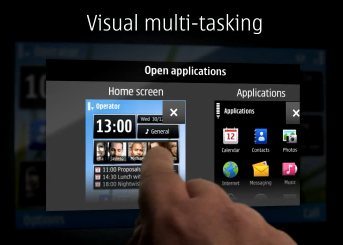 Only this time there are revolving homescreens – Android-style – so that a user can access many more widgets. The Symbian Foundation, Nokia’s ambitious open source project designed to give longevity to the Symbian OS, has launched a new blog inviting the ‘community’ to submit their own User Interface mockups. UI of course is an area where Symbian is perceived to be lagging behind competitors, such as Apple’s iPhone, Android, and the Palm Pre’s Web OS. It’s also something so fundamental to the user experience that it seems odd, even in a small way, to farm this out to the community. My fear is that, like many an open source project, you could end up with ‘design by committee’. The boldest moves are made from a position of strength, not when the chips are down and you’ve very little to lose. Nokia’s decision, announced today, to acquire the remaining 52 per cent of Symbian it doesn’t already own and make the mobile platform open source, is bold to say the least. To achieve this, Nokia will join other industry players, initially AT&T, LG Electronics, Motorola, NTT DOCOMO, Samsung, Sony Ericsson, STMicroelectronics, Texas Instruments and Vodafone, to form the non-profit Symbian Foundation, although any company can join. 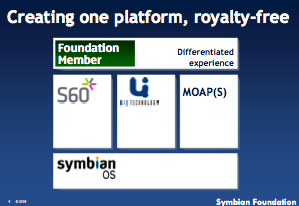 Together the foundation will unify the Symbian OS with its various competing User Interface layers – primarily Nokia’s S60 and Motorola and Sony Ericsson’s UIQ – into a single open platform for “converged mobile devices”. The new foundation, in which Nokia has the biggest seat since it will swallow up all of Symbian’s current employees, will oversee the process of releasing the new OS under the Eclipse Public License (EPL) 1.0 open source license – a transition that will take two years – and become its long-term custodian.